A message that went viral on social media at the weekend had called for every citizen, regardless of race or political affiliation, to take to the streets in protest this coming Friday. National police on Sunday said they were not aware of protest action set to take place nationally next week over President Jacob Zuma and corruption. However, the police had taken note of the message circulating on social media and the matter would be monitored by the National Joint Operational and Intelligence Structure, national police spokesperson Vish Naidoo told News24. 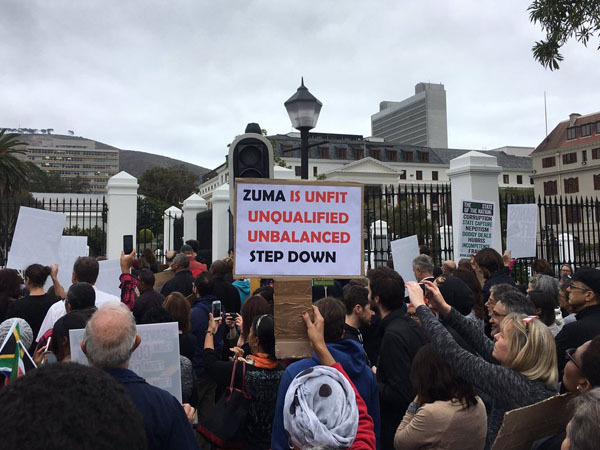 The message urged people to join a nationwide shutdown, and ended with the hashtags #ZumaMustFall and #SouthAfricaMustRise. A Facebook event, titled “The day SA comes to a standstill #sawillrise” was being hosted by the Zuma Must Fall March and We are South Africans on Friday. By Sunday night, at least 3 300 people had indicated they would participate. The organisers posted that they were working endlessly behind the scenes with updates on where people would be gathering in each city or town. “We urge as many organisations as possible to come on board and make this the most monumental day SA has seen in a very long time,” they said. Naidoo warned that certain processes needed to be followed for any march to take place. He also warned people to be wary of hoax messages doing the rounds on social media. A subsequent message on the Facebook event page urged people to first sign up on the We Are South Africans website if they wanted to organise a related protest in their area. They said at least 48-hour notice of a protest needed to be given to council. Participants were urged to refrain from violence.